I’ll work 8 rows before and after the pattern and for the pattern I’ll work 1-24 twice. An interesting pattern, but I’m not sure about having those long strands for the leaves just hanging there. 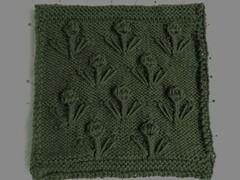 An enjoyable pattern to knit though. Plus I could have done a better job thinking out the top and bottom border to square it up to 9". I think seed stitch would have worked well or just plain rev stockinette. This pattern is a section of the Tree of Life Afghan. The pattern can be found here.